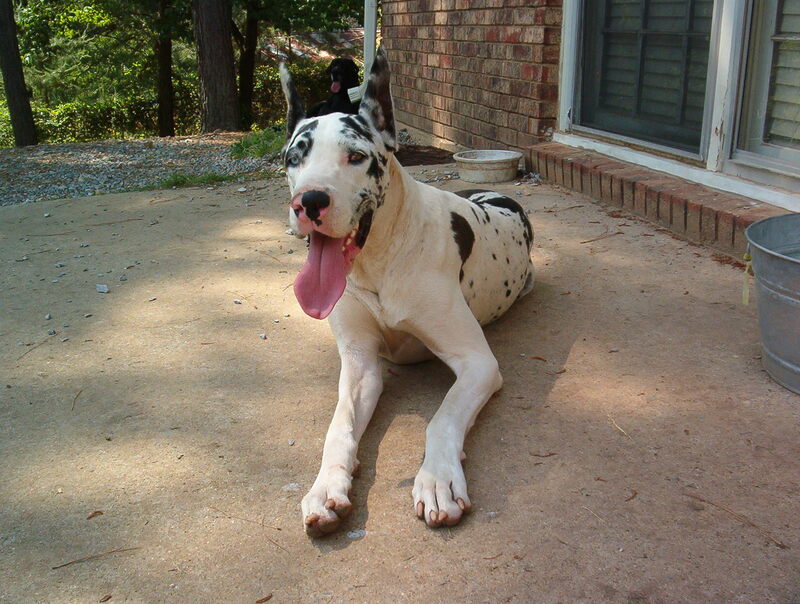 The Great Dane is an impressively large yet elegant breed with a muscular and well-built body. While the fawn color does tend to have a dark muzzle and perhaps ears, Danes come in at least 7 different color patterns (brindle, blue, black, black-masked fawn, harlequin, or mantle) and there are several other variations within those. The dogs rectangular head is long with well defined features and a brave, expressive face. Both the eyes and the ears are medium sized and generally dark in color. At rest the dog's ears droop downwards in a typical relaxed fashion, however they may also be held erect when alert. 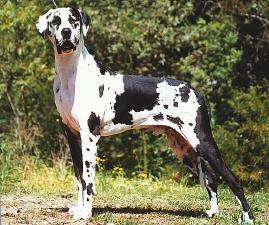 While no standard ear coloring has been established, many Great Danes' ears are adorned with unique black markings. 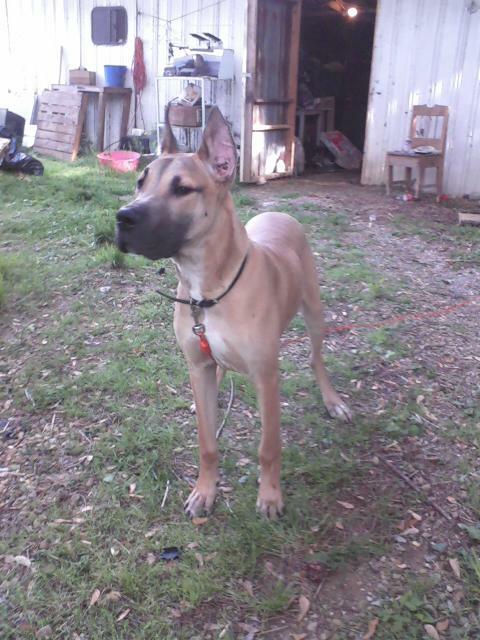 The Great Danes body as a whole looks very firm and is covered by a clean, short coat. The tail begins at a broad base from which it slowly tapers off to a tip that may be ornamented with black markings. Common Misspellings Great Dayn, Grate Dane or Great Dain. The breed is intelligent, loyal, kind, and is not aggressive by nature (however it can be aggressive in a defensive situation). 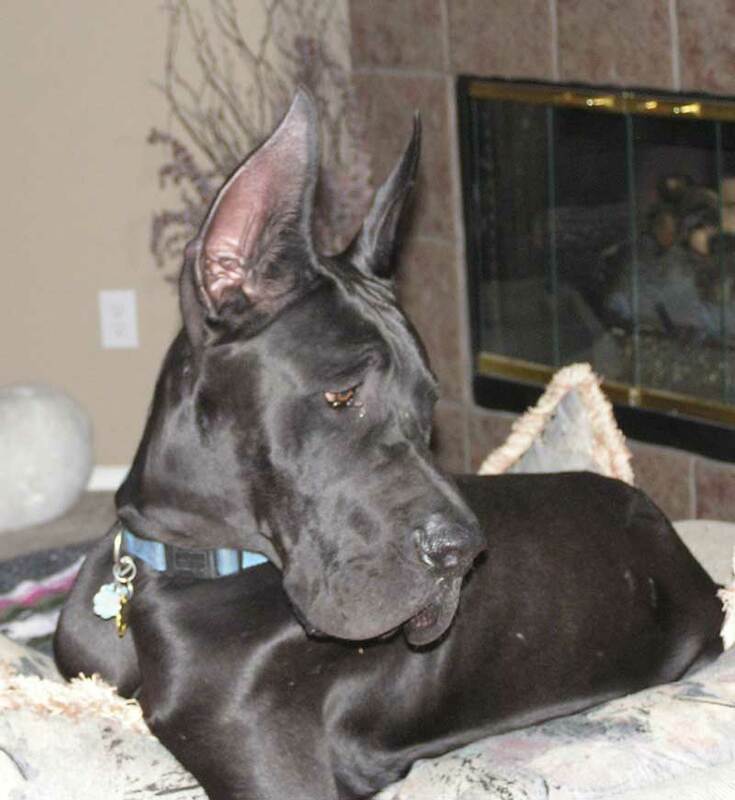 Although the Great Dane is not an extreme barker, the breed can still make a good watchdog and may intimidate intruders with its large size and sturdy build. 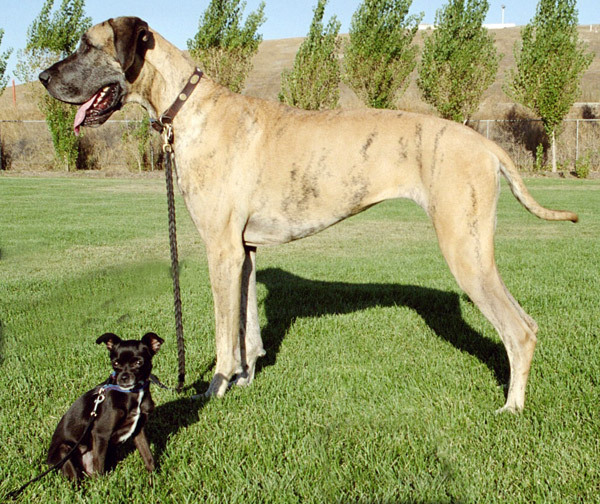 The Great Dane is also characterized by an independent streak that can potentially make training difficult; it is important to demonstrate ones control and position of dominance, as this will make training the dog much easier. Though it is practically inconceivable for a Great Dane to be aggressive toward a child, the dog's large size and potentially boisterous play can result in accidents - watch your dog closely when it is in the presence of children. 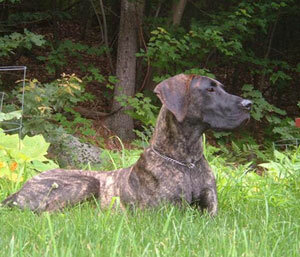 With regard to exercise, Great Danes do best with at least one long walk a day and could always benefit from more. 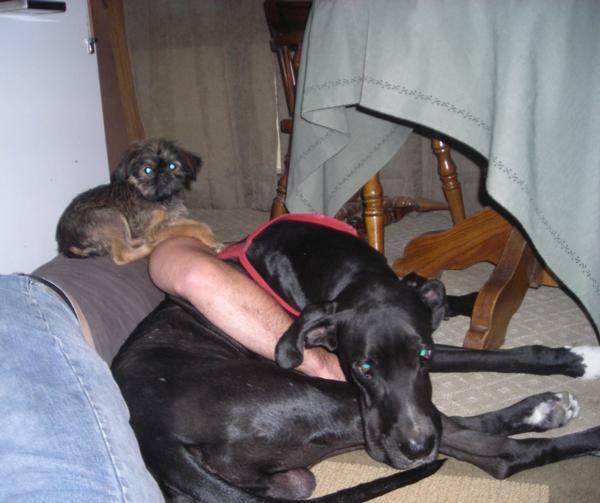 The Great Dane's need for human contact makes it a poor candidate for outdoor living. The short coat requires little care, and a weekly brushing should keep it looking good. The dogs toenails should be trimmed about twice a month. Because Great Danes can be stubborn at times, it is strongly recommended that these dogs begin obedience training at a young age. 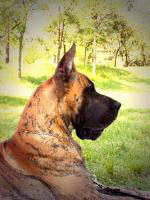 Health issues particular to this breed include gastric torsion, osteosarcoma and heart problems. 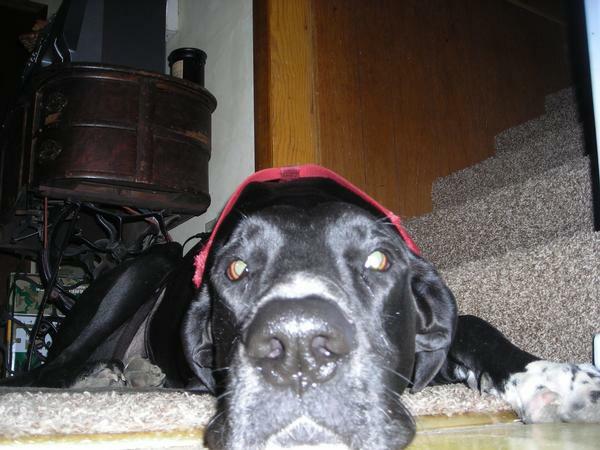 Less common health problems: canine hip dysplasia, hypothyroidism and Wobblers syndrome. 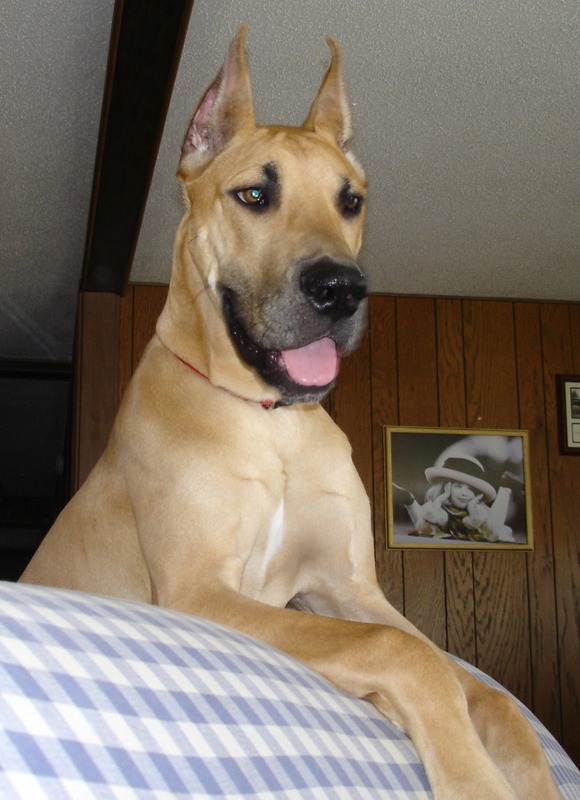 The Great Danes oldest relative is probably the Molossus dog, which was used in warfare in ancient times, but the dog we know today has almost certainly been influenced by several other breeds. Beginning as long as one thousand years ago, the crossing of various breeds including the Greyhound, Irish Wolfhound and English Mastiff began the breed that would one day be called the Great Dane. Taking its size from its wolfhound and mastiff forebears and its sleek appearance from the Greyhound, the Great Dane had established itself as a competent hunter and guard dog by 1300, and was particularly popular as a boar hunter. 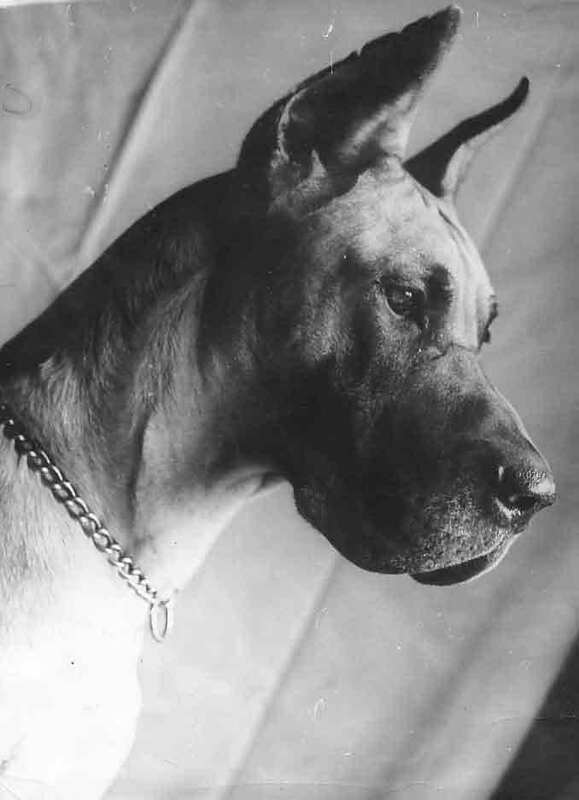 When and for what reason the breed was given the name Great Dane is something of a mystery, but in 1880 the Germans attempted to staunch the inaccuracy by insisting that the dog be called the Deutsche Dogge. English speakers were unmoved, however, and the name Great Dane stuck outside of Germany. The dog was brought to the United States in the late 19th century, and the Great Dane was recognized by the American Kennel Club in 1887. Today, the Great Dane is among the most popular of breeds in the US, and is the largest dog that consistently ranks in the top 25 in AKC registrations. 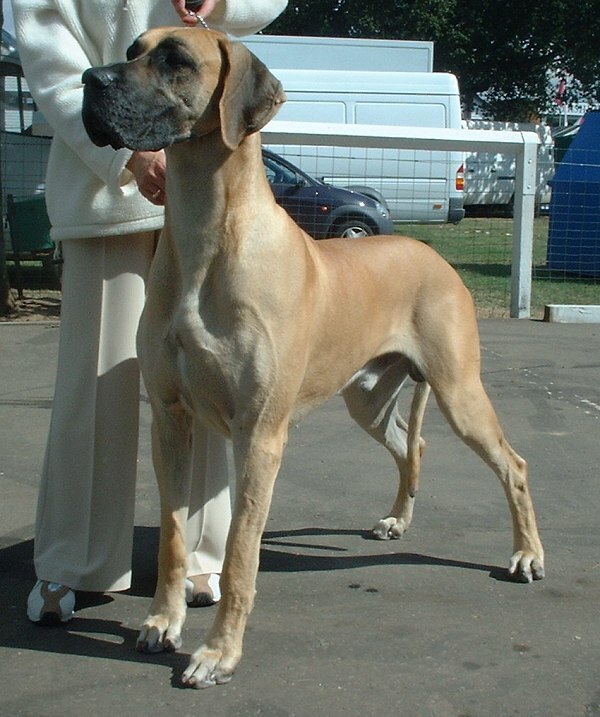 The Great Danes imposing height and elegant appearance have led fanciers to give it the nickname Apollo of Dogs.